What Price Do We Pay For Beauty?? Great article that I wanted to share! Are we truly afraid to mess up our new do or is hair just another excuse among many not to exercise? I know I am guilty of spending much more on hair/beauty products then my health. For example, I am reluctant to spend the money out of my Health Spending account to see the allergist for the allergies I have been struggling with, but I will spend the same amount, with no regrets, on hair products in a month. It’s not all at one time, so it’s a little easier to swallow, but the money for the allergist is money set aside for health so what gives? So I am back!!! I was gone for a while because I wasn’t feeling so great about my hair. I didn’t think I could help others when I was in such a bad state!!! I had been dying my hair blond since April of 2010. It looked great at first but then I noticed that it was extremely dry and broken off. Additionally, my hair was different colors since trying to get my roots died the same shade blond every 8 weeks was a major task. I was so scared that I would have to get all of my hair cut off that I refused to visit a salon. After some time, things were so bad that I forced myself to make an appointment. I had to go to a same day salon (Hair Cuttery), so I wouldn’t talk myself out of what I thought had to be done. (SB: I loved the salon and will be going back every 8 weeks for a trim). I prepared myself for yet another Big Chop (I was just above APL). When I sat in the chair, I immediately told the beautician my issues. To my surprise, she laughed. She told me that blond die tends to be drying and will wreck havoc on someone’s hair, but all I needed was about a 2 inch trim. I was sooo relieved. I proceeded to go back to my dark brown original color (the end result was a little darker then my natural color) and I will not be going blond anytime soon…if ever. WHEW! 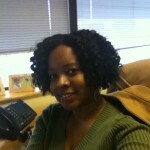 I feel much better about myself and I can go back to my old hobby of caring for natural hair. My hair looks and feels great which means I look and feel great! Look out for more blogging in the upcoming months as I get back on track with my healthy hair regimen. I LOVE this video! I am so happy that Sesame Street has taken notice and decided to help our girls feel better about their hair. I definitely try hard to instill a love of hair in my daughter. I try to make hair time enjoyable. I allow her to choose different styles (many were shown in this video) and I make hair time a special time we spend together bonding and talking about different topics. Lately, she has been learning to read, so she reads to me while I finish her requested style. She loves to show off her finished hair to her dad and her brothers when she’s done! I work hard to ensure she remains in love with her hair in it’s natural state. Joey Mazzarino, the head writer and a puppeteer at Sesame Street, wrote this song in response to his daughter. Joey and his wife have an adopted Ethiopian-born daughter named Segi. He noticed that she was beginning to experience hair issues (issues that most Black women can identify with). Mazzarino decided he wanted to do something to help other young girls appreciate their beauty and embrace their differences. He wrote the song and, with the help of Sesame Street, created this adorable Muppet character. She showcases the variety of ways she can wear her hair while singing its praises and dancing. I LOVE LOVE LOVE my natural hair. I didn’t always feel this way. It has definitely been a long, long journey. I enjoy playing in my hair and researching and trying new techniques. 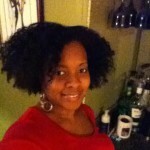 A former “Product Junkie”, I have recently become very interested in natural hair products. I’ve found that the same natural hair products are usually also great for the skin. I am asked, constantly, about hair due to the variety of styles I try on myself and my daughter. I find myself writing notes and emails to give to different people who send me questions, so I have decided to consolidate all that information and start a natural hair blog. This blog will be dedicated to natural hair and natural products with some fashion and style thrown in (because I like it)! Bear with me as I get the site up and running. I hope you enjoy and feel free to contact me with any questions or article ideas!